Stephanie McAdam and Gayle Quiros scored 4.23 masterpoints with a ★67.86%★ game at In Tempo Bridge Club. See full results of this game. Eliot Minsker and Sandy Belfer scored 0.28 masterpoints with a 50.11% game at Bridge On Shea. See full results of this game. 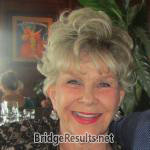 Donald Meyer and Barbara Herzberg scored 1.01 masterpoints with a 57.63% game at In Tempo Bridge Club. See full results of this game. Stephanie McAdam and Marcia Aspinall scored 0.67 masterpoints with a 52.08% game at In Tempo Bridge Club. See full results of this game. Phebe Packer and Liselotte Pouh scored 1.13 masterpoints with a 57.64% game at In Tempo Bridge Club. See full results of this game. John Babb and Ken Batko scored 1.20 masterpoints with a 57.05% game at Bridge On Shea. See full results of this game. Leon Gildin and Barbara Paton scored 0.65 masterpoints with a 53.02% game at Bridge On Shea. See full results of this game. John Urciuoli and Ken Batko scored 0.30 masterpoints with a 52.25% game at Bridge On Shea. See full results of this game. Gerald Viedrah and Bill Berry scored 0.36 masterpoints with a 48.07% game at Bridge On Shea. See full results of this game. Fred Klein and Stephanie McAdam scored 3.38 masterpoints with a 59.18% game at In Tempo Bridge Club. See full results of this game. Stephanie McAdam and Don Gladman scored 3.72 masterpoints with a 58.52% game at In Tempo Bridge Club. See full results of this game. Fred Klein and Stephanie McAdam scored 4.00 masterpoints with a ★61.4%★ game at In Tempo Bridge Club. See full results of this game.